A strategic ordnance platform flown by brave Resistance pilots, the B/SF-17 heavy bomer arrives to X-Wing™ as a towering, large-base ordnance platform with room for one systems upgrade, one tech upgrade, and two bombs. 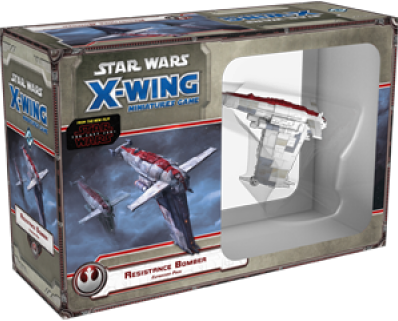 In addition to its pre-painted miniature starship, the Resistance Bomber Expansion Pack provides a host of potential pilots and upgrades. In total, you’ll find four ship cards, thirteen upgrades, one condition card, a maneuver dial, and all the plastic and tokens you need to rain destructive ordnance upon the First Order!